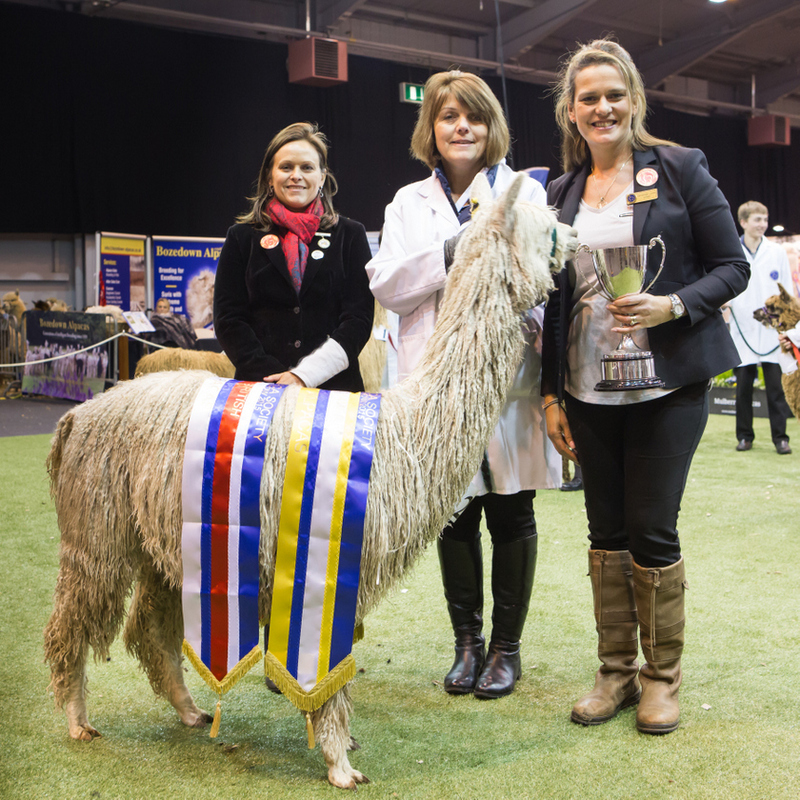 The BAS National was held, for a second time, at The International Centre in Telford, which is proving to be a most professional and successful venue for the show…..
Halter show entries were at capacity with approximately 400 alpacas taking part. 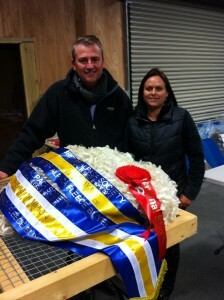 The Halter Show was tandem judged by Natasha Clark and Cathy Lloyd, who proved themselves to be an excellent team. 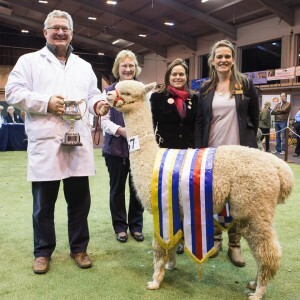 The winner of the Supreme Champion Huacaya was Popham Havengore from Popham Alpacas and the Supreme Champion Suri was Houghton Mystical Magic from Houghton Hall Alpacas. There were over 100 fleeces in The National Fleece Show, sponsored by British Alpaca Fleece Buyers, hosted at CS Alpacas and judged by Natasha Clark and Matthew Lloyd. The winning fleeces were Supreme Champion Huacaya, Ashwood Hope from Ashwood Alpacas and the Supreme Champion Suri was Houghton Royal Duchess from Houghton Hall Alpacas. The fleeces made a magnificent display in the centre of the Ludlow room and full show results are available on both the National Show and BAS websites. Over 120 guests attended the Black Tie dinner hosted by The Alpaca Stud and listened to Michelle Malt, President of the AAA, and Natasha Clark talk about the Australian alpaca industry and thoughts for the future. Presentations of The National Fleece Awards and the new Penrose Fibre to Product awards, won by Teesdale Alpacas and Alpaca Pals, were followed by the hugely entertaining Singing Waiters. Once again, we were able to donate nearly £3,000 to Severn Hospice through door takings and the very generous donations for the raffle at the Gala Dinner. A very different evening will be held next year as this one would be hard to beat! All the Trade Stand spaces were filled with a selection of products from equipment and feeds, to clothes and yarns with everything in between. The Fibre Zone was a stunning display of what can be produced from alpaca fibre, both huacaya and suri, displaying yarns, cushions, bags, hats and woven cloth. Of particular interest were the skirting demonstrations and informal talks given by competition judge, Val Fullerlove, supported by Emma Taylor of the Fibre Committee. A full report on The Fibre Zone and the competition winners was in the Spring edition of Alpaca. 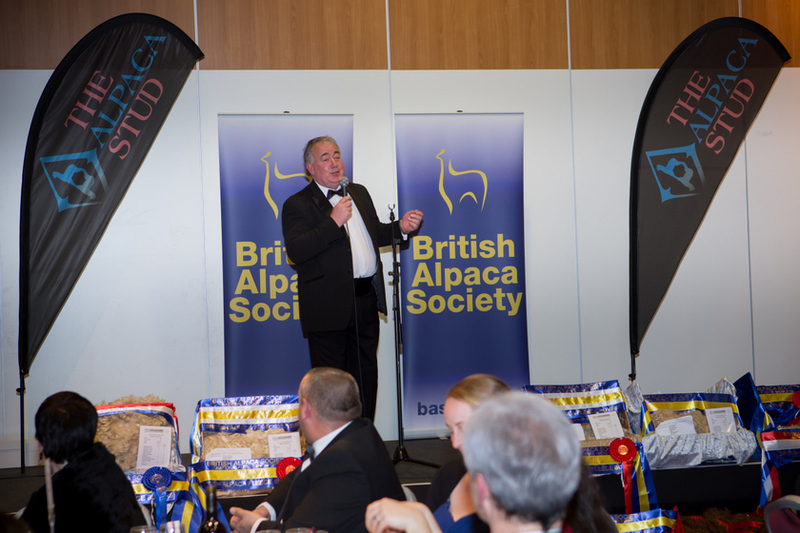 A special award was presented to Steve Tucker of GWF Nutrition by the Board in recognition of his long-standing assistance and commitment to the British Alpaca Society. 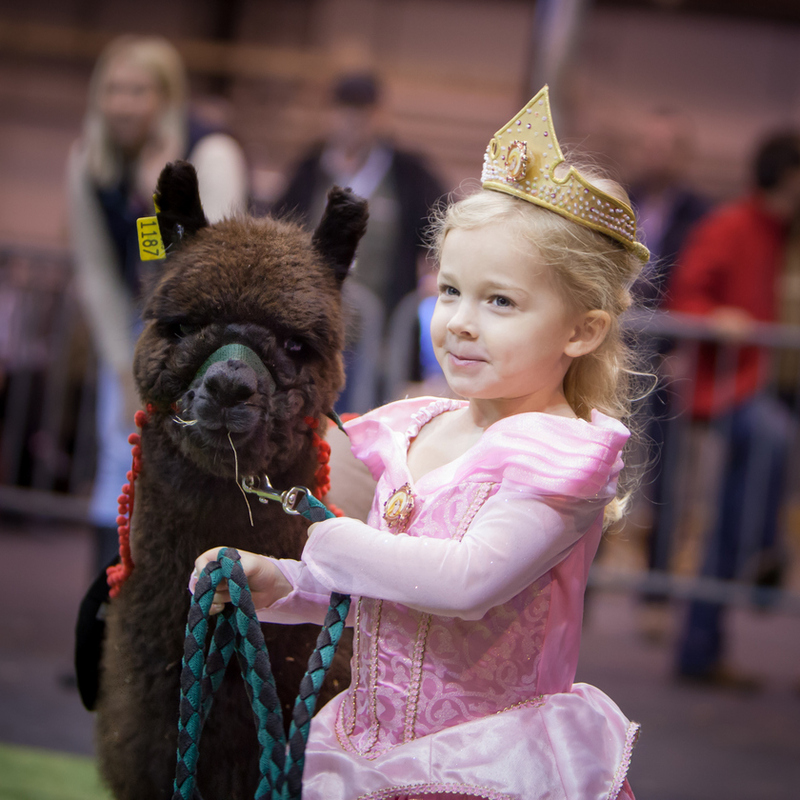 Once again, the Junior Handler was a taste of things to come in the alpaca world with some very impressive handlers across the age groups and the Fancy Dress, won by Sleeping Beauty, Olivia George, was a delight, as always. The BAS National is a major driving force in helping to raise the profile of alpacas both in the UK and Europe, this year having TV airtime on The One Show on BBC1 and Radio 5 live in the week leading up to the show. 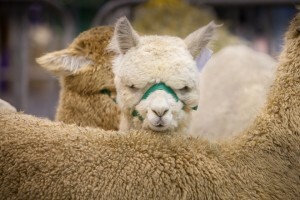 The success of the BAS National Show is a result of the support from it’s members and the alpaca industry in general. Without so many volunteers, exhibitors and sponsors we would not have been able to hold such a prestigious event. We thank you all for making the BAS National Show 2015 something to be proud of and special thanks to our major sponsors, Wilcox @ Edgemere, Ashwood Alpacas, Bozedown Alpacas, Houghton Hall Alpacas and Moonsbrook Alpacas. Next year’s dates are 5th & 6th March at the same venue and due to the exceptional interest now generated by the show, we are increasing the capacity for 2016. There will be two rings and 4 judges working in tandem and all aspects of the National will be together in Hall 1 and part of Hall 2. SEE YOU THERE!